In a medium bowl, mix the cocoa and hot water until a smooth paste forms. Mix in the vanilla and eggs to form a liquid. In the bowl of a stand mixer, mix together the flour, sugar, baking powder and salt on low speed for 30 seconds. Add half the chocolate mixture and the butter and mix until the dry ingredients are incorporated. Increase the speed to medium and mix for one minute to aerate the batter. Scrape down the sides of the bowl and add the remaining chocolate in two batches, mixing for 20 seconds each time. Fold in the flaxseeds. 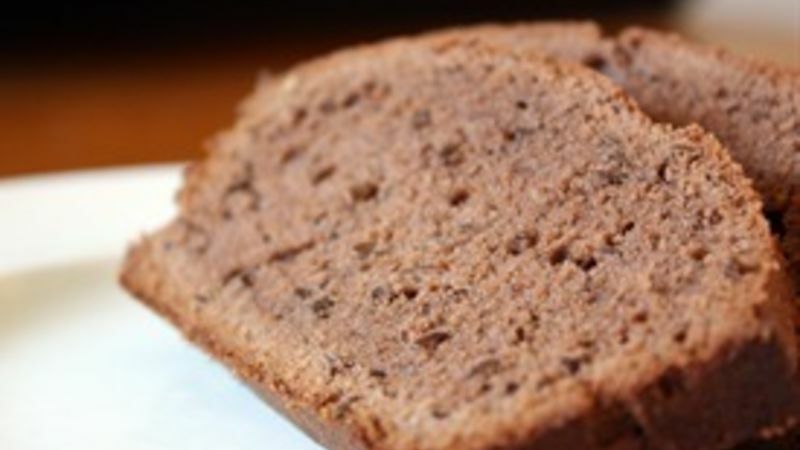 Pour the batter into a greased 9 x 5-inch loaf pan and smooth the surface with a spatula. Bake 50 to 60 minutes until a wooden toothpick inserted in the center comes out clean. About 25 minutes into baking, cover loosely with aluminum foil to prevent over-browning. Allow to cool 10 minutes in pan, then remove from pan and allow to cool completely on wire rack.